Joe St. Clair in 2001. Joseph Szentkiralyi was born July 5, 1913. He was always a man of action and has committed his life to service to others. He served his required two years in the Hungarian military from 1937-39, where he led an artillery platoon on a mountain–top observation post. After his military service, he went to work for the Hungarian Cultural Ministry. They sent him to the United States in 1939 to establish the Hungarian Cultural Ministry. Joe Anglicized his family name to St. Clair. He and his wife Maria had their first son, Joe Jr., and made plans to start a new life. From 1939 to 1941, Joe was a Reference Librarian in the Hungarian Reference Library in New York City. With the bombing of Pearl Harbor and the start of World War II, the family was ‘interned’ along with several hundred other Axis diplomats and their families as "political prisoners" for several months while waiting for a Red Cross-brokered exchange for U.S. officials, newspapermen, and other civilians who were held in German hands after Pearl Harbor was attacked. The family along with the Axis diplomats were interned in the exclusive Greenbrier Hotel in White Sulfur Springs, West Virginia, while the Americans were interned at a comparable German hotel awaiting the exchange. Their second son Akos was born while the family was interned in the hotel. On May 7th, 1942, the family sailed from Jersey City, NJ, aboard the Swedish transport ship SS Drottingholm, loaded with 948 Axis diplomats from Germany, Italy, Bulgaria, Rumania, and Hungary. 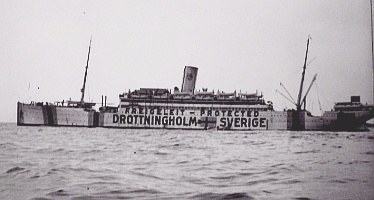 (The SS Drottingholm was a so-called "Mercy Ship" owned by the Swedish-American Line and was chartered by governments after negotiations by the Red Cross. During the war the SS Drottningholm made 14 voyages to allow for the exchange of diplomats, prisoners of war and Jews with passports from neutral countries. The ship was painted with texts like "Protected" and "Freigeleit" (safeguard) and flew the Swedish flag. It had to evade mines on its own.) After landing in neutral Lisbon, Portugal, the St. Clair family returned to Budapest, where my father was first attached to the Hungarian Cultural Ministry as a translator and information officer. Joe and his family were deported from the United States on the Swedish "Mercy Ship" SS Drottingholm. The words on the side indicate the nature of it's diplomatic mission. 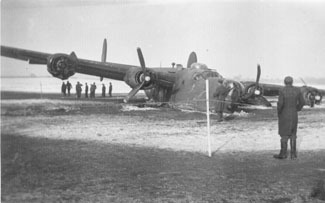 Joe interviewed the crew of this B-24H Liberator that crash landed near the village of Csáktornya, Hungary. Joe watched over the air crew of a B-24H that crash landed in a snowy field near the village of Csáktornya, Hungary (known today as Cakovec, Croatia) on Feb 22, 1944. Joe was ordered to interpret for the Americans and observe the application of the rules of the Geneva Convention. Joe spent two days with the crew. He spoke excellent English and spoke with the crew several times. Although he didn't ask the airmen any questions of military significance, the German intelligence service arrived and ordered him to reveal everything they told him. When he refused, under the Geneva Convention, to divulge some sensitive information the crew members had told him. He was threatened with a court-martial by his Hungarian-German military superiors. But the situation in Hungary was rapidly deteriorating and Joe was transferred from one unit to another. Later that year he was ordered to report for an interrogation, but just as he was about to be summoned for an interview, the air raid siren sounded and everyone ran for the shelter. Joe also ran, but for the nearest exit. As a civilian English and history instructor he endured troubled times like many others in war-torn Hungary, and he performed many heroic acts. After Hungary was occupied by the Germans March 1944, Joe was assigned to monitor the young American crew members of one of the first B-24 bombers to crash land intact inside Hungary. His refusal, under the Geneva Convention, to reveal sensitive information the crew disclosed to him so angered the military authorities that they initiated Court Martial proceedings against him. In evading the authorities he was at times forced to hide in the more hazardous upper floors of apartment buildings during a period of frequent bombing raids. During the terrible six-week long winter-time Siege of Budapest, he cared for family and friends who sought refuge in his apartment building's bomb shelter. From December 29, 1944-March 13, 1945, the Russians remorselessly attacked the city. Joe, along with others, prevented starvation and risking their lives by leaving the bomb shelters to butcher horse carcasses frozen in the streets. This was one of many challenges they faced to help keep their families alive. Such experiences shaped his later priorities: time and devotion to family, service above self, leadership development and character building. After the war ended in 1945, he landed a similar position as translator and information officer with the American Legation in Budapest. This gave him not only a source of income but as an employee of the Americans, food, unlike many others who were starving. As the Cold War heated up and political tensions between the United States and the Soviet Union escalated, Joe became aware that he was being targeted by the Communists as an undesirable. Once the German occupation was over and the Allied (principally Russian) occupation had begun, Joe once again found himself a wanted man—this time by the Communists. Employed as a translator by the American Embassy in Budapest, he read the news bulletins that came to the American press attaché and knew that the western nations were slowly giving up Central Europe to the Soviets and that this would not bode well for him or anyone else having links with the United States. People began disappearing and his suspicions grew when a friend at the Embassy failed to show up for work one day. Shortly thereafter, he found a note on his desk that read, "You are next." With the help of the Americans, Joe fled Hungary immediately. His family followed him to Switzerland a short time later, and they eventually made it to the U.S.
My father learned later that he had been accused (and tried in absentia) of espionage for the Americans. which Joe said was a fabrication. Thus Joe, Maria, Joe Jr., and Akos Szentkiralyi were forced to leave friends and relatives and begin life anew in the United States— this time (after a name change) as the St. Clair family. With the start of the Cold War and little more than a letter of recommendation from the Catholic Primate of Hungary, Cardinal Josef Mindszenty, Joe had to choose between positions either as a broadcaster with the newly formed Voice of America in New York City, or as the first instructor in the newly established Hungarian Department at the Army Language School (later Defense Language School-West Coast Branch) in Monterey, California. He never regretted his decision to move to the West Coast. "With the Lincoln Award, the American Hungarian Studies Foundation wished to recognize the unique role [the Hungarian Department] has played in American education by transmitting most effectively the Hungarian language and culture to more than 800 students; the department has won nationwide acclaim for its pioneering efforts in applied linguistic research and of developing language teaching techniques and materials which have been emulated widely throughout the United States educational system; the members of the faculty in the department have been distinguished scholars with exceptional ability and a strong commitment to the teaching of Hungarian; individually and collectively the faculty has assumed significant civic and cultural responsibilities on the local and national levels; never before nor anywhere else in the world has the Hungarian language and culture been taught so effectively to so many students of non-Hungarian background as it has been by the Hungarian Department of DLI-WC." "Mr. St. Clair understood the responsibility of the manager as being primarily one of leadership in the highest sense of the word. In whatever position or assignment he received, Joe St. Clair was invariably an enlightened guide, a relentless, demanding, but inspiring leader of both his students and his faculty. Numerous students of all ranks in the service, or now out of the service, are richer human beings thanks to Joseph St. Clair's teaching and personal attention...to guide, train and stimulate the DLI faculty was probably what Joe St. Clair most wanted and could best do. Yet, his superior management ability and broad professional expertise was needed in another critical assignment and in 1977 he became chairman of the Multi- Language Department that included seven languages: Hungarian, Albanian, Chinese-Cantonese, Danish, Dutch/Flemish, Norwegian, and Swedish. The complexities, both pedagogical and administrative, of this unique department were such that only a man of Joe St. Clair's competence and authority could have obtained satisfactory results while at the same time, clearly document that the Multi-language concept was neither effective training-wise nor, in reality, economical." Joe St. Clair in 1968 at the Wood Badge staff conference held at Ft. Ord, California..
At the same time Joe was leading the Hungarian Department, he and Maria managed to successfully raise a family of four boys, first in Ord Village (now the site of Seaside High School), then in two homes in Del Monte Park, an unincorporated area outside Pacific Grove. The second of these homes Joe built with his own hands next to the first home. Wherever he lived, Joe St. Clair made significant contributions to his community. This commitment began at the University of Budapest as leader of the Catholic men's service organization. It was here that he met Maria Naszodi, who coincidentally was head of the Catholic women's service organization. His dedication to serving others continued in the United States as an active member of the Pacific Grove Kiwanis Club and the Knights of Columbus. At one time Joe donated more blood than any other donor on the Monterey Peninsula. Joe's contributions to the Monterey Bay Area Council, Boy Scouts of America, and the White Stag Leadership Development Program specifically, left a legacy for others to emulate. He was Scoutmaster of Troop 129 in Pacific Grove and recognized by the Monterey Bay Area Council for his service to youth with the Silver Beaver Award in 1962. He was a Wood Badge Deputy Camp Chief and course developer and a recipient of numerous other citations and special awards from the Boy Scouts of America. Upon moving to Scotts Valley in 1972, the focus of Joe's volunteer activities shifted from Scouting to other organizations. As a Red Cross volunteer, he regularly drove the sick over Highway 17 to hospitals in Santa Clara County and assisted in local disaster relief efforts. But it was the California Grey Bears that benefited the most during Joe's "retirement" years. As a charter member of this pioneering senior citizen volunteer self-help organization, and with Maria at his side, he was involved in all phases of an increasingly complex operation. This included annual sit-down Christmas dinners for the needy held at the Santa Cruz Civic Auditorium, distributing fresh and packaged foodstuffs to homebound seniors throughout Santa Cruz County, and operation of the largest recycling center in Santa Cruz County. Once or twice a week he might help harvest vegetables. Another day might be spent at the warehouse packaging them. And on Friday he would drive a loaded pick-up truck along a special distribution route in Aptos. As a member of the Executive Board he spearheaded the expansion of the Grey Bear's real estate assets and operations to its current size, and until full time care for Maria became necessary, he could be found driving a forklift around the recycling yard every Saturday. He received numerous awards for his contributions to the Grey Bears, including a citation from Assemblyman Keeley, D-Santa Cruz, for over 10,000 hours of community service work. Joe has been a constant inspiration to his four sons, three grandchildren, two great-grandchildren, and to the numerous members of his extended family of friends and relatives—both here and abroad—and to the communities in which he has lived, worked and played such a vital role. 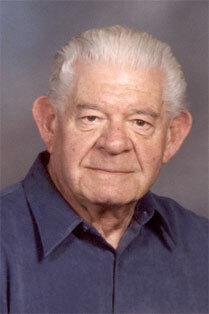 Joe passed away of natural causes at age 94 on January 4, 2008. He was interred next to his wife of 62 years, Maria, in the Holy Cross Catholic Cemetery in Santa Cruz, California.